Ravenscar is a coastal village in the Scarborough district of North Yorkshire, England, approximately 10 miles (16 km) north of Scarborough. It is within the civil parish of Staintondale and the North York Moors National Park. Until the early 20th century it was known as Peak or The Peak. A National Trail, the 110-mile (180 km) Cleveland Way, passes through Ravenscar, which is also the eastern terminus of the Lyke Wake Walk. The official end of the Walk is at a point where the path meets the coast road. The 2001 UK census recorded for Staintondale parish (including Staintondale as well as Ravenscar) a population of 319. Raven Hall, built in 1774 (see below), was once owned by Dr. Francis Willis, physician to King George III, and it is rumoured, without evidence, that King George stayed there during his treatment. To the north of the village is the old Peak alum works, now a National Trust site, but once an important part of the dyeing industry. Ravenscar was the location of a late 4th-century Roman signal station, part of a chain that extended along the Yorkshire coast. At the edge of the village is a disused windmill, Peak Mill, which dates from 1858. At the turn of the 19th–20th century, plans were made to turn the village into a holiday resort to rival nearby Scarborough. Roads were laid out, some houses were built and sewers were laid. 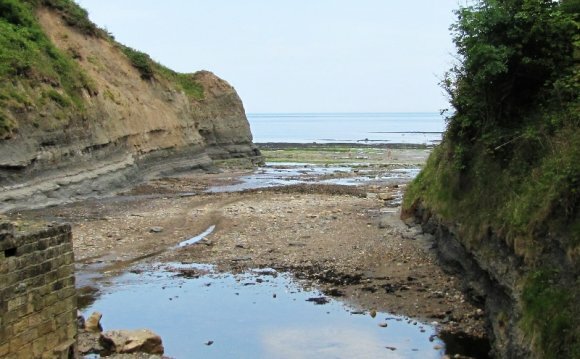 Because of the long trek to its rocky beach, Ravenscar never achieved popularity, and the development was left unfinished – a sort of ghost town with sewers and streets but no houses. In 1540, a farm known as Peak House owned by the Beswick family occupied the site of a 5th-century Roman fort. In 1774 Raven Hall was built on the site for Captain William Childs of London, a captain in the King's Regiment of Light Dragoons, who came to Yorkshire with the army and became the owner of the Alum Works at Ravenscar. On his death in 1829 the hall passed to his daughter Ann Willis, whose family (headed by Dr Francis Willis) had become wealthy from treating George III and other royalty for their medical conditions. Ann's son, the eccentric Rev Dr Richard Willis, built the gardens and battlements which surround the house. In 1845 the property passed into the hands of William Hammond of London. Hammond became a prominent local benefactor, building the village church and the windmill. He became a director of the Scarborough to Whitby railway line, insisting that it passed through his property via a tunnel and that Ravenscar should have a station.